An interview with Colin Snodgrass of the Open University, UK, who coordinates a consortium of professional astronomers observing Comet 67P/Churyumov-Gerasimenko from Earth in support of the Rosetta mission. Q: Rosetta has been 'living' with Comet 67P/Churyumov-Gerasimenko for almost a year now. How was this year from the perspective of the professional astronomers observing the comet with telescopes on Earth? A: It has been a very exciting year for everyone in comet science, following the results from Rosetta, but thankfully the ground-based view of 67P didn’t get too exciting yet – the comet largely followed our predictions in terms of its total brightness, which is reassuring as it allows us to have confidence in our plans for observing (and for Rosetta). We watched the comet grow from a single dot to show a clear comet-like shape in 2014, and then had a relatively long winter where we couldn’t observe the comet (between November and April). Now that the comet is back within reach of our telescopes, it is an even more impressive sight, with a long tail visible in deeper images. Recently, as the comet is approaching perihelion, it is much more active. We can now study the gasses and large-scale dust jets in the coma from ground-based observations. 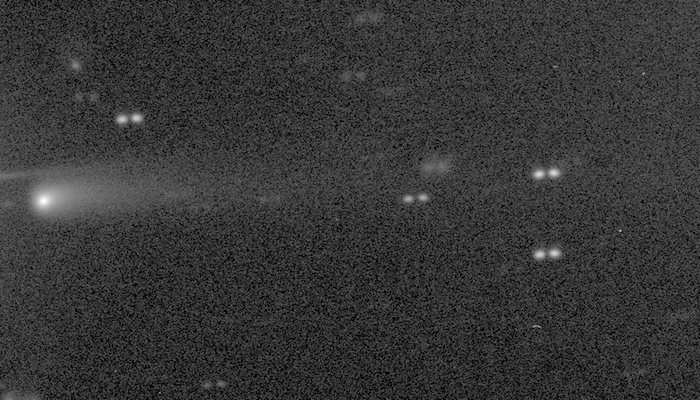 Recent image from the 2 m Liverpool Telescope, taken on the morning of 19 July 2015. It comprises 10 x 20s r-band images. The length of the tail visible in the image in the twilight sky is approximately 120,000 km. Q: How many observatories were involved and how often have they observed the comet? A: In 2014, the comet was still relatively faint, with a magnitude of around 20, approximately 400,000 times fainter than the naked eye can detect, so most of the observations were performed with some of the biggest telescopes available on the ground: the European Southern Observatory's Very Large Telescope and the Association of Universities for Research in Astronomy's Gemini South telescope, both located in Chile. Other observatories were also used, including the TRAPPIST comet-chasing telescope, also in Chile, the Nordic Optical Telescope on La Palma, in the Canary Islands, and the Las Cumbres Observatory Global Telescope Network, which operates robotic telescopes at several locations across the globe. Then, from the end of 2014 and for the first few months of 2015, the comet was too close to the Sun to be observed from anywhere on Earth; when professional telescopes could see it again, in May, it was much brighter than at the end of 2014, with a magnitude around 15. Many more telescopes in the northern hemisphere are now becoming involved in the observations, including the William Herschel Telescope and the Telescopio Nazionale Galileo on La Palma and ESA's optical ground station on Tenerife, in the Canary Islands, the BTA-6 optical telescope of the Special Astrophysical Observatory of the Russian Academy of Science in the Caucasus Mountains, the Canada France Hawaii Telescope and the NASA Infrared Telescope Facility on Mauna Kea, Hawaii. Some of our colleagues are also observing the comet at microwave and radio wavelengths with the IRAM and ALMA observatories. We are now following the comet most nights using robotic telescopes, including the Liverpool Telescope on La Palma and the STELLA telescope on Tenerife, which have made special efforts to aid our campaign – enabling new modes of operation to track a moving target like 67P in the case of STELLA, and even building a completely new spectrograph to be sensitive to cometary gasses on the Liverpool Telescope. Q: What can you tell from the data? Is the comet behaving as expected from its previous perihelion passes? A: The comet's large-scale activity is increasing in good agreement with the predictions from previous observations. However, comets are unpredictable and we must always expect the unexpected! For this reason, it is especially important to have a large network of telescopes involved in the campaign, so that we can guarantee a fast response in the case of any sudden change to the comet's behaviour. After perihelion we will also have special ‘target of opportunity’ mode observations ready, which can be triggered on short notice, just in case there is a major outburst at the comet. One of the other results that we have from observations so far is that there is a significant asymmetry in the comet’s activity – we have only recently been able to detect the gas in the coma from the ground, but we know that we were able to detect the same gasses much further from the Sun after perihelion in previous orbits. We will continue to follow the comet throughout the rest of the extended Rosetta mission to confirm this, and to better understand why this is the case. 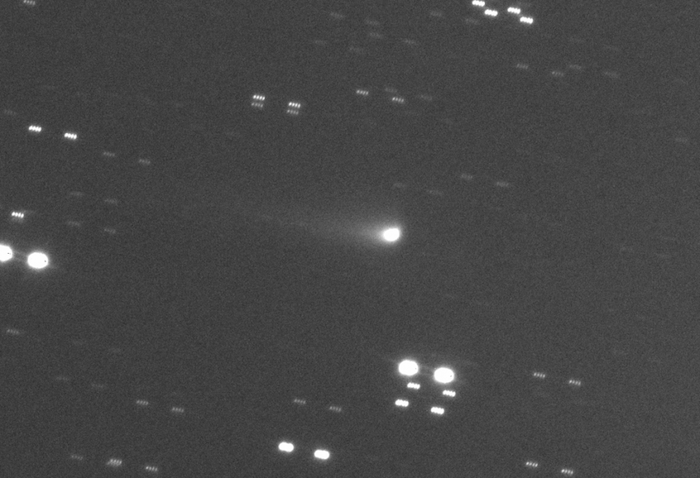 Q: Which telescopes will be observing the comet around perihelion? A: At perihelion the comet is in northern skies, so it cannot be seen from the larger telescopes in Chile, like the VLT and Gemini South. Our campaign moves to telescopes north of the equator, including those in Hawaii (e.g. Gemini North, NASA’s IRTF) and the mainland USA, and European facilities, especially those situated in the Canary Islands. 67P is too close to the Sun to point the Hubble Space telescope to it until October, but a large variety of telescopes on the ground are able to contribute – but only for a very short period before sunrise each night. This is one of the reasons to have telescopes around the world observing. Q: What are you looking forward the most from these observations? A: As the comet reaches perihelion its activity level is high enough that we can detect jets within the coma that are thousands of kilometres in length. These must somehow be linked with the activity pattern that Rosetta sees at the nucleus, but as yet no one knows how the small jets seen in OSIRIS or NAVCAM images (which are only a few km long) relate to the very large-scale structure seen from ground. Coming up on the blog soon: an update on the amateur observing programme and how you can get involved. Today’s CometWatch entry was captured by Rosetta’s NAVCAM on 20 July 2015 from a distance of 171 km from the centre of Comet 67P/Churyumov-Gerasimenko. The image scale is 14.5 m/pixel and the image measures 14.9 km across. Although the activity is visible to some extent in the original image (provided at the end of the post), we have increased the contrast in the above image to better show off the details. In this orientation the comet’s small lobe is to the left and the large lobe is to the right, with several distinct streams of activity visible around the sunlit portion of the small lobe. The activity streaming from around the neck region appears to extend to at least the edge of the field of view, several kilometres away. Scientists are studying how these fine details close to the nucleus relate to the vast coma observed from afar, such as from ground-based telescopes on Earth. It is interesting to compare details of the activity in this entry to that on 7 July, where the comet is seen in a similar orientation. Similar details in the comet’s nucleus can also be picked out. For example, the transition between the Seth and Anubis regions on the large lobe is quite clear in this orientation, with a distinct ridge separating the quasi-circular depressions in Seth (left) from the smoother surface of Anubis (right). 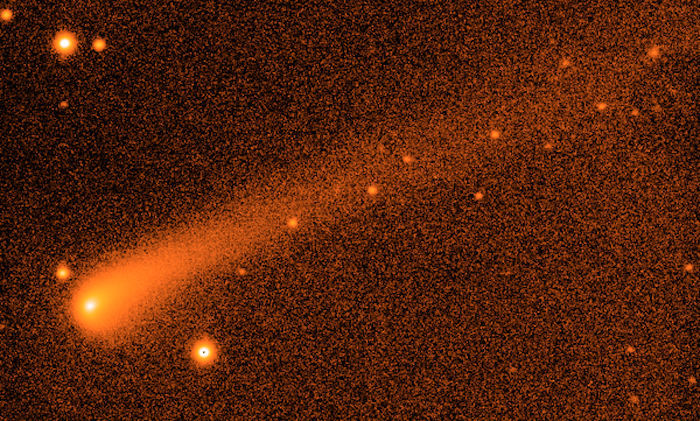 The silhouette of the comet to the bottom of the scene is also framed against the background glow of activity. This blog post is based on the papers “Evolution of the ion environment of comet 67P/Churyumov-Gerasimenko: Observations between 3.6 and 2.0 AU ” by H. Nilsson et al. ; “Rosetta observations of solar wind interaction with the comet 67P/Churyumov-Gerasimenko” by T.W. Broiles et al. 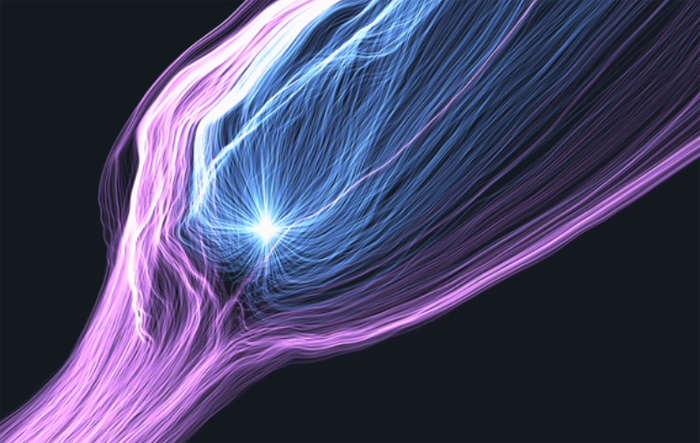 ; and “Solar Wind Sputtering of Dust on the Surface of 67P/Churyumov-Gerasimenko ” by Peter Wurz et al., which have all been accepted for publication in Astronomy and Astrophysics, and “Dynamical features and spatial structures of the plasma interaction region of 67P/Churyumov–Gerasimenko and the solar wind” by C. Koenders et al, which is published in Planetary and Space Science. Rosetta is making good progress in one of its key investigations, which concerns the interaction between the comet and the solar wind. The solar wind is the constant stream of electrically charged particles that flows from the Sun, carrying its magnetic field out into the Solar System. 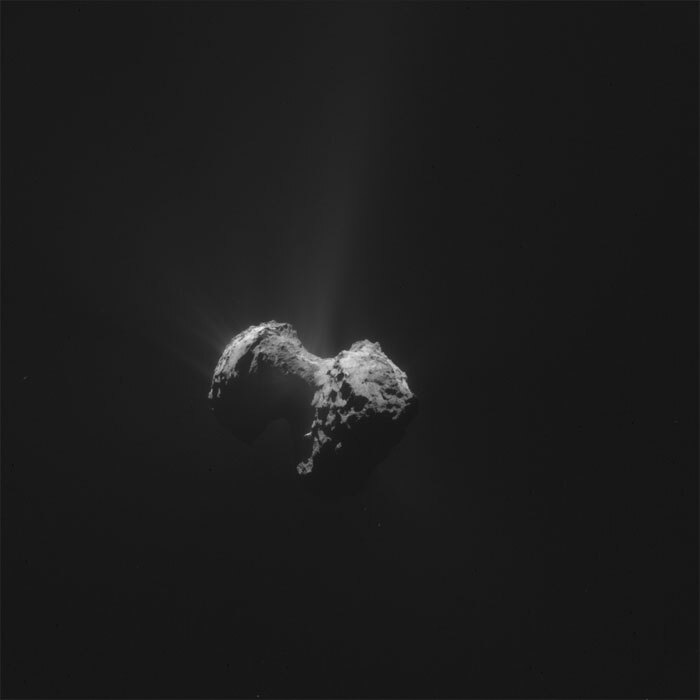 Like all comets, 67P/Churyumov–Gerasimenko must navigate this flow in its orbit around the Sun. It is the constant battle fought between the comet and the solar wind that helps to sculpt the comet’s ion tail. Rosetta’s instruments are monitoring the fine detail of this process. Using the Rosetta Plasma Consortium Ion Composition Analyzer, Hans Nilsson from the Swedish Institute of Space Physics and his colleagues have been studying the gradual evolution of the comet’s ion environment. They have seen that the number of water ions – molecules of water that have been stripped of one electron – accelerated away from the comet increased hugely as 67P/C-G moved between 3.6AU (about 538 million km) and 2.0AU (about 300 million km) from the Sun. Although the day-to-day acceleration is highly variable, the average 24-hour rate has increased by a factor of 10,000 during the study, which covered the period August 2014 to March 2015. The water ions themselves originate in the coma, the atmosphere of the comet. They are placed there originally by heat from the Sun liberating the molecules from the surface ice. Once in gaseous form, the collision of extreme ultraviolet light displaces electrons from the molecules, turning them into ions. Colliding particles from the solar wind can do this as well. Once stripped of some of their electrons, the water ions can then be accelerated by the electrical properties of the solar wind. 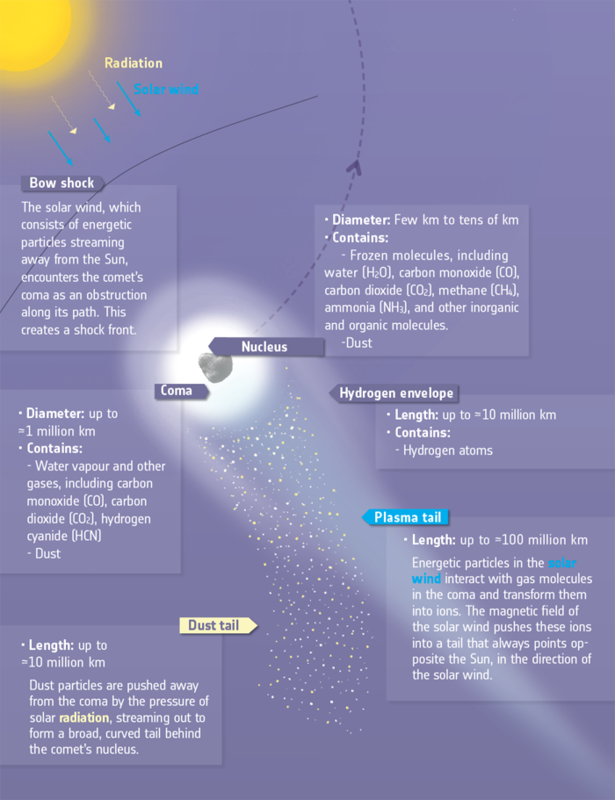 Not all of the ions are accelerated outwards, some will happen to strike the comet’s surface. Solar wind particles will also find their way through the coma to hit home. When this happens, they cause a process called sputtering, in which they displace atoms from material on the surface – these are then ‘liberated’ into space. Peter Wurz from the University of Bern, Switzerland, and colleagues have studied these sputtered atoms with Rosetta’s Double Focussing Mass Spectrometer (DFMS), which is part of the ROSINA experiment. They have so far discovered sodium, potassium, silicon and calcium, which are all present in a rare form of meteorites called carbonaceous chondrites. There are differences in the amounts of these atoms at the comet and in these meteorites, however. While the abundance of sodium appears the same, 67P/C-G shows an excess of potassium and a depletion of calcium. Most of the sputtered atoms come from the winter side of the comet. Although this is the hemisphere that is mostly facing away from the Sun at present, solar wind particles can end up striking the surface because they are deflected during interactions with ions in the comet’s coma. This can be a significant process so long as the density of the coma ions is not too large. But at some point the comet’s atmosphere becomes dense enough to be a major defence, protecting the icy surface. As the comet gets closer to the Sun, the sputtering will eventually stop because the comet will release more gas and the coma will become impenetrable. When this happens, the solar wind ions will always collide with atoms in this atmosphere or be deflected away before striking the surface. The first evidence that this deflection is taking place at 67P/C-G has been measured with the Rosetta Plasma Consortium Ion and Electron Sensor, by Thomas Broiles of the Southwest Research Institute (SwRI) in San Antonio, Texas, and colleagues. Their observations began on 6 August 2014 when Rosetta arrived at the comet, and have been almost continuous since. The instrument has been measuring the flow of the solar wind as Rosetta orbits 67P/C-G, showing that the solar wind can be deflected by up to 45° away from the anti-solar direction. The deflection is largest for the lighter ions, such as protons, and not so much for the heavier ions derived from helium atoms. For all ions the deflection is set to increase as the comet gets closer to the Sun and the coma becomes ever denser. As all this happens, Rosetta will be there to continue monitoring and measuring the changes. This was the raison d’être for the rendezvous with this comet. Previous missions have taken snapshots during all too brief fly-bys but Rosetta is showing us truly how a comet behaves as it approaches the Sun.